Home / 4TH AmCham ScholaRun / AmCham ScholaRun / scholar / Singlet / Sports Gear / The 4TH AmCham ScholaRUN - "To Run Where I Started!" The 4TH AmCham ScholaRUN - "To Run Where I Started!" Now it's time to pay back, to look back where I started. It's been one year ago, and it's time to run to where I started. 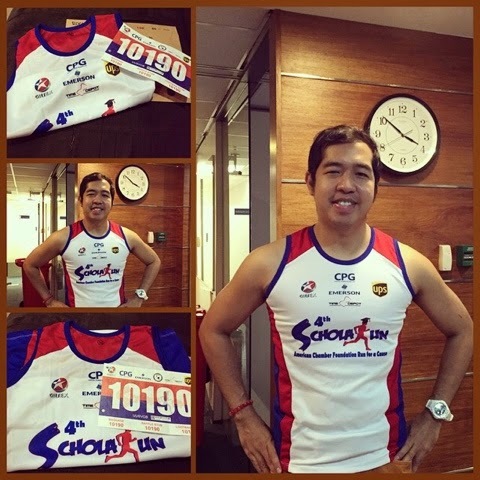 This coming March 1, 2015, yours truly will run for the 4TH AmCham ScholaRUN. "Dito ko tatapusin ang hindi ko nagawa last year!" At the same time, I'll run for the benefits of the scholars since I'm also a scholar way back in collage! I'm so excited to run for it! I love their singlet this year. It's better than last year. And red dominates the color of the gear.